On Friday, May 15th 2009, Scott Schechter died of a sudden heart attack. It’s a bit ironic and fitting that he was on his way home from working on yet another project. He has left a void in the world of Garland/Minnelli fans everywhere.I am shocked and saddened by his tragic death, and I send my deepest condolences to Scott’s husband and family. Scott was the premiere Judy Garland/Liza Minnelli historian/author. His work encompassed all types of media: CDs, DVDs, books, publications, and the Internet. Scott was always – and I mean always – 100% supportive of The Judy Room and The Judy Garland Online Discography. He was a delight to talk to, and I’m glad to have met him and I’m very proud that he was more than a colleague, he was my friend. Scott was incredibly passionate about the lives and careers of both Judy Garland and her daughter Liza Minnelli. He was committed to getting previously unreleased material (or material that hadn’t been seen in decades) into the hands of the public. 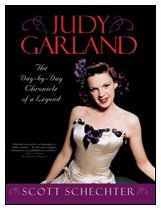 He was also committed to celebrating, as he called it, “The Legend’s Legacy” (Judy Garland). Scott was close to Liza. This relationship helped forge one of his greatest projects, Liza’s official U.S. website: OfficialLizaMinnelli.com. I am proud that he came to me to design the site and to perform the periodic updates and maintenance.I would tell people that I was “once removed from Liza”, meaning that Scott would talk to Liza and/or her managers & publicists, and then relay the information to me to add to the site. Scott was very proud that the site became the main Liza site of the web. And I am thrilled to have helped him see his ideas come to life on a living website. The following is his biography from his 2004 book “The Liza Minnelli Scrapbook” – followed an update from me. When looking at his work, it’s amazing how varied Scott’s projects were. All of the images are projects that Scott either produced or worked on in some capacity. Without Scott, we probably would not have had the amazing Pioneer DVDs of Judy’s TV series, nor would we have the remastered and complete CD releases of Judy’s Capitol albums “The Letter” and “Garland at the Grove”, among other treasures. UPDATE: I have been advised that Scott actually passed away late Thursday night, May 14th.